The previous chapters presented a number of novel techniques to tackle a variety of problems encountered in real-world text classification settings. The common underlying thread has been the integration of knowledge in the inference of inductive learning models without penalizing processing time. This chapter unifies the main topics of this book into a framework. 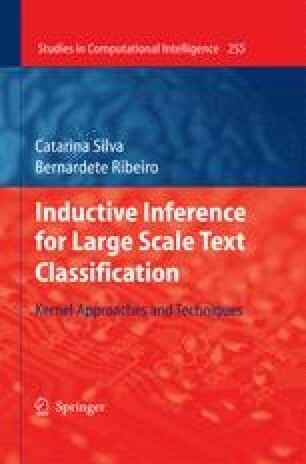 An inductive inference-based text classification framework will provide basic generic tools that are appropriate for a broad range of applications. New research trends in text classification are highlighted towards the end. We will focus on the particular developments in kernel methods triggered by new problems in text mining and on how to extract useful knowledge by mining relationships between data. We include a few promising research directions that are likely to expand in the future.